Adventure is only a few (thousand) strokes away! I often find myself planning an adventure or trip, during an adventure or trip. Perhaps this is because I have time to think and reflect during these times of solitude and isolation. Admittedly, some of the schemes I find myself planning are quite ambitious . . . to say the least! The trip to East Caicos described here was sown as a seed during my recent Cotton Cay expedition and it proved to be as adventurous and fruitful as I had hoped. I have always enjoyed exploring both North and Middle Caicos—both easily reached via the Caribbean Cruisin’ TCI Ferry—and once there it feels like a different world from Providenciales. I love the rugged beauty and the physical sense of history that prevails with the ruins of plantations and old homes scattered throughout the islands. I always enjoy going to the “end of the road” which is the small jetty in Lorimers, MIddle Caicos where the asphalt road stops abruptly just before the sea. I often wonder how many unsuspecting drivers have been surprised by this quirky little stretch of road. More recently, I have rekindled my love of Wild Cow Run, a truly deserted beach at the very end of Middle Caicos. It’s a magnificent beach and whether it is as calm as a pond or being pounded by breakers, it is an unspoilt gem of a location. 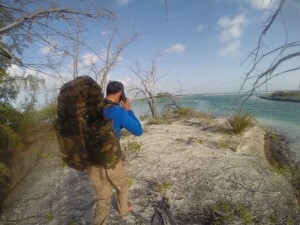 It was from here I decided to set out for East Caicos, another island on my “must visit list.” I had been told many times that the crossing was shallow and tricky by boat so I decided on a three-day, self-supported expedition by kayak. First decision . . . where to source a kayak? This was a done deal for me, as I was aware of the successful and professional bonefishing operation at Bottle Creek run by Howard Gibbs and Kevin Styles from the Last Chance Bar & Grill. They have a multitude of flats boats, fishing SUPs and state-of-the-art kayaks which would be perfect for my needs. I contacted Howard and Kevin, who were very supportive (if a little dumbfounded) by my idea, and we all agreed it looked like it was possible to do. After some in-depth planning, weather checks, and a dollop of great advice from Howard (a trained boat builder, he has been on North Caicos for twenty years and really knows his stuff), a date was set and it was a GO! Arriving at the Last Chance early in the morning, courtesy of Mac Campbell, the ever-efficient and utterly charming North Caicos taxi driver, Howard and Kevin were all ready for me, albeit a little in shock at the amount of gear I had packed! As this was to be a self-supported trip, food, shelter, and water were the most important factors, and I needed enough water to last three days plus any emergency delays. Due to the remoteness, I had also packed a satellite phone and full trauma medical kit, which included an IV kit. This all added up to lot of weight (nearly ninety pound in all). The water alone weighed fifty pounds and, although Howard had suggested towing a second kayak loaded with the supplies, I opted for towing a small inflatable instead. I rechecked all my kit while Kevin and Howard attended to a couple from the US who were renting kayaks for bonefishing that day. It’s plain to see that the “Last Chance” pair love what they do and are eager to help others have a great time. After loading Howard’s jeep, we set off for Wild Cow Run and, thanks to some expert off-roading by Howard, managed to get the kayak and all supplies almost to the beach itself. After handshakes and “good lucks” it was time to go. Howard reversed back through the bush and was gone. I surveyed the weather, and it was clear the wind and waves were against me from the start. As soon as I set off I realized what a struggle it would be. 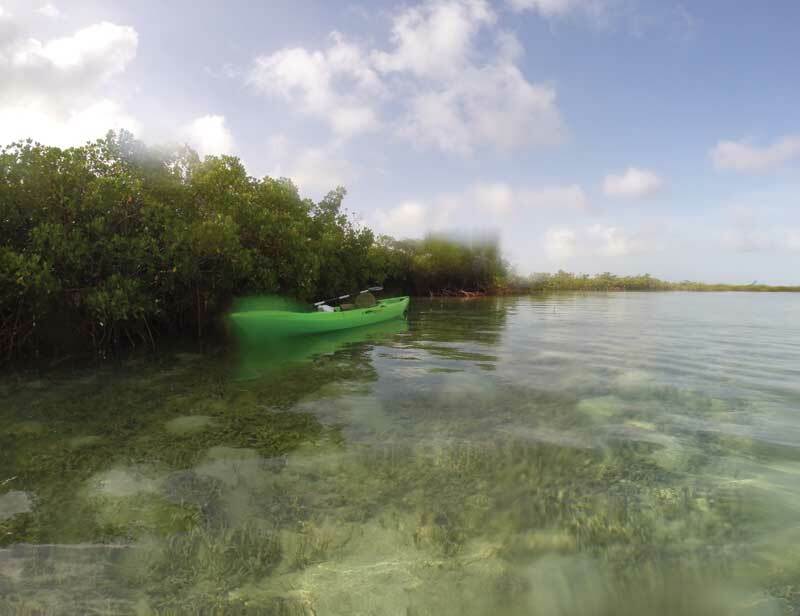 I had barely travelled a mile before the water became too shallow to paddle and I opted to walk in the shallows and pull the kayak behind me. This is actually easier than paddling against the wind. I must have walked for a few miles, passing Dickish Cay, before I spied Joe Grant Cay ahead of me. Paddling once again, I bypass the enticingly gorgeous deserted beach and I set off for the high bluff at the end of Joe Grant Cay, which is home to some small ruins. Once safely ashore with kayak secured, I climbed the small hill to enjoy the view from the ruins. I set up my satellite phone which will send my position, via GPS satellites and viewable on Google Earth, to my emergency backup crew. Besides Kevin and Howard, I have coerced both Roger Halliday (Caribbean Cruisin’) and Dave Douglas (Attabera Cruise charter) as they are both professional boat operators and I can think of no one else who I’d trust more to organize a rescue should it be necessary, as the fact that I am totally alone is never far from my thoughts. Dave texts back “Enjoy Joe’s house!” so I am happy the system works. My wife gets a quick call too. She is used to my crazy adventures by now, but still understandably worries just a little. I set off once again and although I have been paddling/walking for nearly two hours, I have only covered the two miles or so from Middle Caicos. I see East Caicos a few miles ahead of me now, and calculate another hour or so should do it, given the relentless wind coming off the reef that I am heading into. Indeed, it’s just over an hour later that I find myself paddling into the calm inlet that separates East Caicos from the far tip of Joe Grant Cay. It’s a relief to be out of the wind and I retrieve my GPS in order to check the location of the old donkey railway that I have come to see. The coordinates I have been given are exact, and no sooner have I landed the kayak then I see the initial trail marker, which is no more than some colored tape tied to a tree. I also step over a multitude of old glass and bottles, most of it handmade, thick glass, which is a reminder of the early inhabitants who struggled to carve out a living here. Barely fifty feet inland, I come across the “Donkey Railway”—entirely manmade of local rock and stone. It really is a basic, yet truly wonderful piece of engineering. It must be some ten to twelve feet wide in places and has been built to rise above the low-lying swampy ground, and its sides can reach four to five feet high. All this material is laid “dry-stone” fashion, and the fact that it is in such good condition after hundreds of years is a testament to those who built it and toiled here. It disappears into the distance but I know this clear pathway won’t last for long, as I have been well-briefed on what type of conditions to expect. After a short way, and due to most of the road being slowly reclaimed by plants, it is difficult to follow by eye alone. A very basic path meanders through the now-thick bush, marked at erratic intervals by ribbon tied to branches. It would be very easy to become disorientated and lost in here! This is also a designated TCI National Trust site and some official markers are visible along the way too. 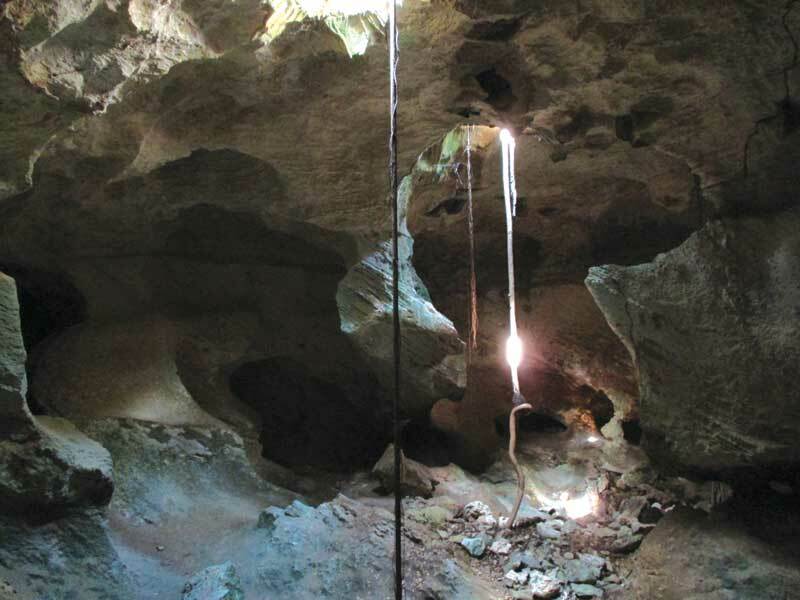 The railway was built in the 1800s to allow fertilizer- rich soil called guano to be mined from the large caves on East Caicos; this was then shipped to such places as Jamaica to help the banana and sugar cane plantations flourish. The business thrived as long as the guano lasted, but the caves were soon stripped down to bedrock and the works were abandoned. It’s to these large caves that I am heading, but have been told of smaller caves nearby from a local guy whose father used to come here in the 1950s to try to hunt some of the cattle that allegedly roamed the island. These caves are well off the track but I intend to locate them. As well as cattle, donkeys too are still here, but theories differ of how they arrived. Some say all the livestock were left over from the sisal plantations of Jacksonville, others say they wandered over at low tide from South Caicos. I imagine a little of both theories is correct. I find the small caves as well as the larger, well known ones, and spend the next few hours exploring. The larger caves at first seem to be one chamber with “hollows” in the walls; these hollows turn out to be tunnels and sub-chambers beyond, which go on underground in a multitude of directions and switchbacks. I am thankful for the flashlight I packed! Bats (source of guano) swoosh down to inspect this uninvited guest by sonar before returning to a hanging perch—I do my best not to disturb them. I see evidence of the old cave works—a channel in the rock that must have made moving material easier. In one of the caves I also see wall markings, but they are impossible to date. Surprisingly, in a deep, dark pool of water, I see shrimp living quite contentedly! It’s now late in the afternoon and the sun is going down. Luckily I have my GPS route to follow back easily and I have found the five or so caves I came to see. Heading back down the railway, I have the sense of being watched, and turn to see a bemused donkey hiding in the bush and watching my progress. I stop to retrieve my camera and also to ask how he got here, but he is in no hurry to divulge his or his hardworking ancestors’ secrets! The cows, however, remain elusive! I get back to my start point and decide to look for more evidence of the old railway. Once I start to snorkel the shallow inlet, I see lengths of old discarded track now laying submerged and abandoned and being slowly reclaimed by nature. 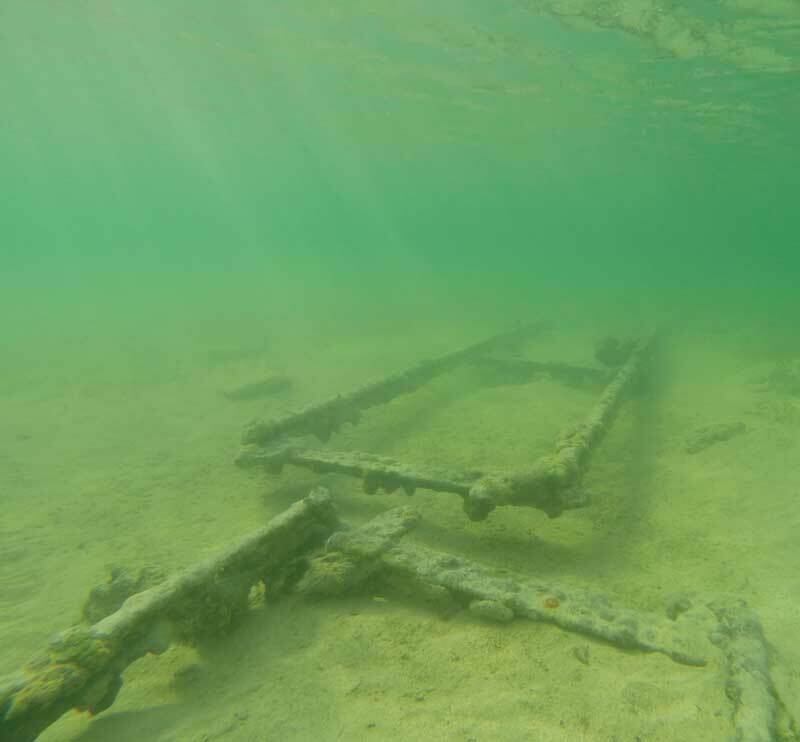 Iron tracks that once carried carts of soil pulled by weary donkeys now rest on the sand frequented only by fish and the occasional turtle. I have a gentle paddle back along the inlet to set up camp for the night. The mosquitoes seem to be on vacation, which is good, but the sand flies are here in force! I have no option but to get into my all-in-one bug suit and set about making dinner for the evening. The meals I have are “boil in the bag” and used by most of the NATO forces. They can be eaten hot or cold and are surprisingly good, despite the ten year shelf life! I treat myself to chili con carne and hot tea before sending a satellite update and a call home. I always cook with an ecofriendly gel which is better for the environment and safer than an open flame. After sunset, I am blessed with a huge full moon and cloudless sky. I sit on my little beach and watch the calm flat water illuminated by a magnificent strip of lunar light, which lays across the water from my feet to the distant horizon. The sand flies seem to give me some respite, as if allowing me to enjoy the moment, and I hear my pal the donkey braying in the distance as I settle in for the night. Sunrise on a deserted beach on East Caicos. I awake at sunrise to see turtles and rays in the shallows, and I join them for a morning swim. I also see conch shells recently harvested but I’m content with my sausage-and-beans-in-a-bag for now! I look back across the calm water and soak in the peace and tranquility— moments like this make all the effort to get here truly worthwhile. I spy the US Coast Guard helicopter flying along the distant horizon. After a brief moment it’s gone, and I realize again how desolate this island is. It’s more than likely I am the only human here on this enormous island at this time. A humbling thought indeed! My plan for this second day is to explore the ruins of Jacksonville, then to push on to some smaller ruins that I have been told about. I pack up and secure all the kit to the kayak. I follow my standard procedure of walking out of my camp backwards, checking all the way. This is to ensure I have left nothing behind, and I am happy that with the exception of a few disturbed pine needles, I have left no impact here whatsoever. I paddle off, my trusty inflatable reluctantly tagging along behind. As I set ashore some way up the coast, I can see the remains of some of the old walling of Jacksonville. I make my way up the hill, and as I battle through the bush, I am aware that there are stone walls, built row upon row, almost entirely from the high tide line to the summit. These are only a few feet high and barely a foot or so separates them. My first thought is that it is “terracing” to act as a defense against anyone charging or attacking from the shore, who would surely be thwarted by all these obstacles. They may indeed have some agriculture or commercial use, but seeing the hard work that it must have taken to construct these in this hostile environment, I opt for the military defense scenario! I am also surprised to see that at least one of the old buildings nearly had a revival not too long ago. I spot new stone walls and concrete arches that have been built. I wonder who undertook these works and what their plans were? They did not come to fruition and again the property lies abandoned until the next attempt to reawaken these beautiful old buildings. I hope that whoever next takes up the challenge does so in a way that pays homage to this beautiful island and all its history. Indeed, this would make a fitting dedicated National Trust site, allowing visitors to both enjoy and learn from the wonders on offer here. After some exploring, I go back down to the shore and head much further along the coast to try to locate some other old structures that I have been told are hidden somewhere in the bush. After some time pushing through the relentless foliage, I come across old walling. Indeed the bush is so thick that I find myself to be within ten feet from an old building and barely even see it! It’s amazing to think that at one time this entire area would have been cleared and the land worked, and these structures were built by back-breaking hard work. Nature now reclaims nearly every square foot. After some hours, I have located three partially intact structures and many more remnants of foundation walling. The walls of many are still coated in their original plaster, made of lime which was produced from burning shells to an ash, then mixing with water. I am immediately taken by how much glass and pottery lies around, although much of it seems to be in concentrated areas and none of it is inside the buildings —almost as if someone once “cleaned house” by discarding all that was left by the previous settlers out of the nearest window! I do spy one bottle which is intact and unbroken. It lays half submerged in earth and seems to be made of thick, handmade opaque glass. I gently brush off the leaves to see any markings but there are none. I wonder not only who touched it last, but who will touch it next? I leave it undisturbed, happy to be just a very small part in this anonymous chain of history. I have a late lunch on shore—with a great view to boot—and decide that I will head back before sunset to Joe Grant Cay and camp for the night. 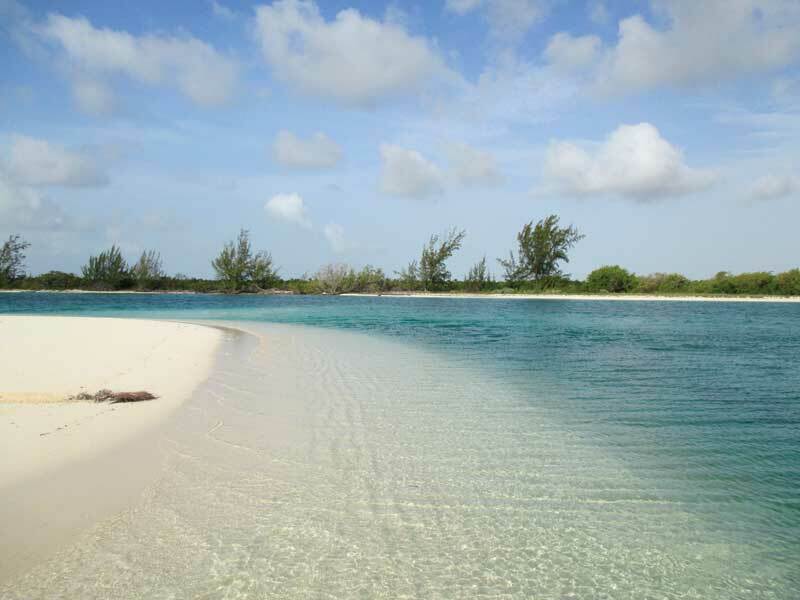 I set off paddling, leaving East Caicos behind, and with the wind now pushing me on I make such good time I decide to pass the cay and chill for an hour on a small low-tide beach on a nearby cay. Again I see a small mound of harvested conch shells, so I am not the first to visit, but I wonder how often human feet tread these sands? Once rested, I set off to set up camp for the night on the beach at Joe Grant Cay. I find a great spot under some pine trees and wonder if their sweet, pleasant aroma has caused this to be a much-welcomed bug-free area! I swim in the calm water of an inlet and have dinner under another rising full moon. Tomorrow I’ll be home, but for now, this really is utopia. At daybreak, I call in on my satellite phone to arrange pick up and set off for the short paddle back to Middle Caicos and Wild Cow Run. Howard is there exactly as arranged and we load up and start back to Bottle Creek, which seems like Manhattan compared to the glorious isolation I have been basking in these last three days. Driving back, with kayak secured atop, we get halfway along Wild Cow Run Road when four teenagers—three girls and one boy, all with rucksacks—flag us down. They want to check directions to Wild Cow Beach where they plan to camp out for the night. They must have already walked a number of miles from Lorimers, and look tired and little dusty but are in good spirits. At forty-five years old, I’ve had more than a lifetime of adventure and still find myself looking for more. Still, I can’t help but admire these “kids” who, in a world of iPads, Smartphones, and non-stop TV, have decided to leave all that behind and start adventure-seeking for themselves. I wish them well. Howard delivers me safely back to Last Chance, where Kevin awaits with a cold beer for me. I deposit all my trash that I have carried back with me, jump into Mac’s taxi and bid them farewell. “Till next time,” I say. For already another seed of an adventure is starting to flourish and take shape . . . The TCI National Trust maintains many historic locations around the country. For tours, information, or to make donations, visit www.tcinationaltrust.com.